Find and compare the best prices from a range of well known car rental companies at Ajaccio (Corsica) Airport. This is a free to use facility, enabeling you to book direct with the company quoting the price. 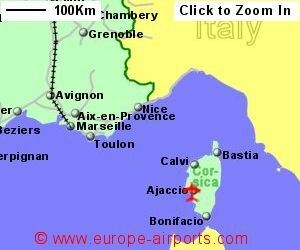 Ajaccio (Corsica) Airport, otherwise known as Napoleon Bonaparte Airport, is located 6Km East of Ajaccio, on the west coast of the island of Corsica, the fourth largest island, and popular tourist destination,in the Mediterranean. 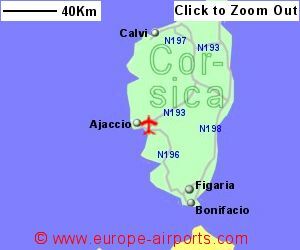 Ajaccio airport is situated on Corsicas rugged western coast close to the capital city. There is a regular bus service between the airport and Ajaccio, where there is a train station, costing 4.50 Euros for the 20 minute journey. Taxis are available during the times of flights. Facilities include 3 bars/restaurants, 7 shops, an ATM, business centre, and FREE WiFi Internet access. Ajaccio airport handled 1.5 million passengers in 2017, an increase of 10% on the previous year, making it the main airport for Corsica.